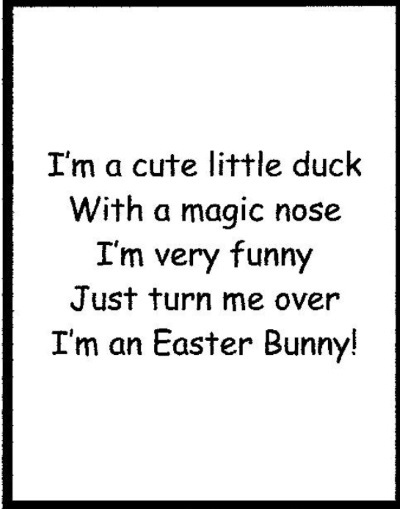 Duck with a poem, flip him and see a Bunny! 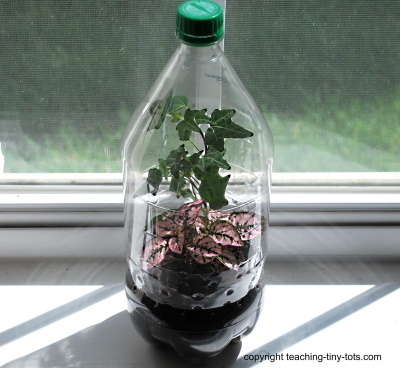 Cute classroom activity appropriate for pre-K and Kindergarten. 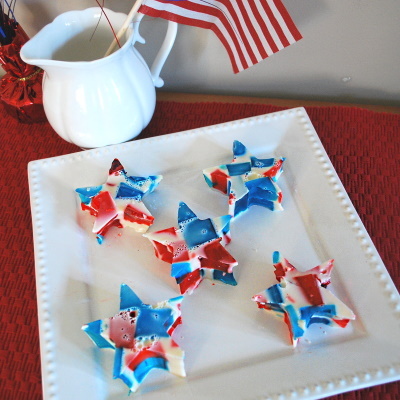 An easy activity that helps develop fine motor skills and simple poem to introduce reading skills. Two wiggle eyes, 1 cotton ball, pipe cleaner, markers or crayons. Print or trace pattern onto construction paper. 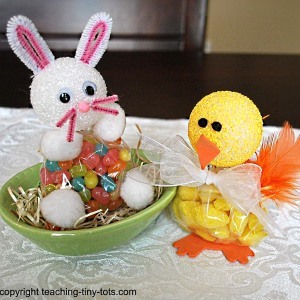 Glue on eyes, nose, bunny tail and whatever items you select to decorate the bunny and duck. You could opt to have your child draw all the features also with marker or crayon or a combination of materials. 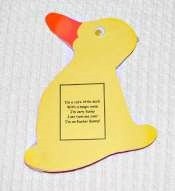 Cut out poem and glue poem onto duck. If your child is doing the cutting, to make it easier, a suggestion is to print the pattern onto one of the construction papers using a printer, glue the two construction pieces together and have your child cut out the shape. That way the two shapes will be the same even if not perfect. In the classroom we often drew the faces because it is much more interesting to see all the variations, however kids love googly eyes! Before this toddler activity, take a couple minutes and talk about the two animals and then talk about which side looks like a duck, where should the eye go, etc. Using a glue stick to glue the construction paper together will minimize wrinkles and may be easier for a young child, however you may need Elmers or craft glue for items like pipe cleaners and wiggly eyes. The Easter Bunny is a mythical character. It is said that the Easter Bunny brings baskets filled with colored eggs, candy and toys to the homes of children on the night before Easter. 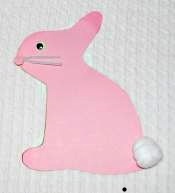 The Easter Bunny will put the baskets in a designated place or hide them somewhere in the house for the children to find when they wake up in the morning. The Easter Bunny can be compared to Santa Clause at Christmas since they both bring gifts to children on the eve of the holiday. Its origin is disputed but the Easter Bunny has been mentioned as early as 1600!